Using a pre-electric shave lotion can be a very effective way of improving the comfort and the closeness of a dry shave. Pre-shaves are easy to apply, widely available and generally inexpensive. The Lab Series Electric Shave Solution from Aramis kinda breaks the mold, costing quite a bit more than the highly popular Lectric Shave or Afta by Mennen. 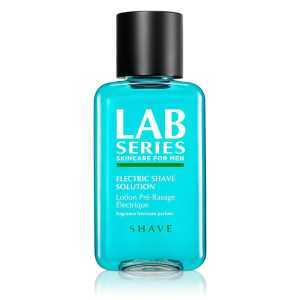 Moreover, the Lab Series pre-shave has been getting rave reviews from users, which makes this product even more intriguing. So let’s see if it’s up to the hype and how it stacks up against the tried and tested pre-shaves we all know. 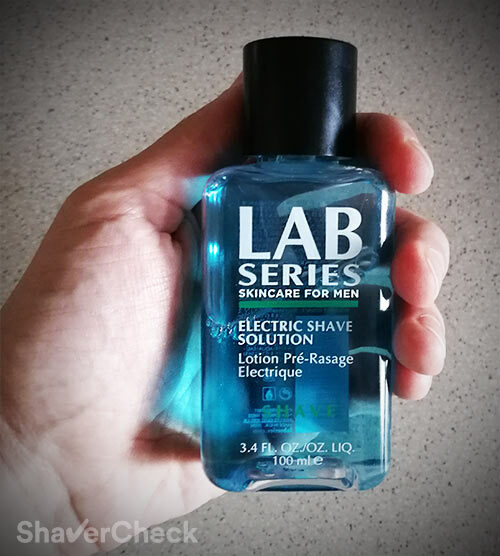 As most other pre-shave lotions out there, the Lab Series is alcohol-based. It is completely oil and fragrance-free, making it suitable for men with sensitive, irritation-prone skin. ALCOHOL DENAT., IISODODECANE, OCTYLDODECANOL, MYRISTYL PROPIONATE, COCO-CAPRYLATE/CAPRATE, CETYL ETHYLHEXANOATE, OCTYLDODECYL MYRISTATE, NEOPENTYL GLYCOL DICAPRATE, COLA NITIDA (KOLA) NUT EXTRACT, TOCOPHERYL ACETATE, BISABOLOL, CHAMOMILLA RECUTITA (MATRICARIA), PROPYLENE GLYCOL DIPELARGONATE, BUTYLENE GLYCOL, WATER, GREEN 6 (CI 61565). At first glance, we can spot some high-quality ingredients, like Kola Nut and Chamomile Extract, Vitamin E and Coco-Caprylate (a natural moisturizer). Although it’s fragrance-free, you can still pick up the alcohol and a very subtle aquatic note, but it is very faint and once the fluid dries it disappears completely. Application and performance: Does it really work? The Lab Series pre-electric solution comes in a small 3.4 OZ./100 ml clear plastic bottle. You press and twist the cap to open, then pour some product in your palms and apply it to your face and neck. Make sure to massage it into the stubble using both hands and work it against the grain, lifting the hairs and prepping them for the shave. Allow the solution 15 seconds or so to evaporate completely, then proceed to shave as usual. After applying the Lab Series pre-shave to the face you’ll immediately feel a very slick, almost oily film covering your face. This will allow your shaver to glide over the skin without that dragging sensation. While I don’t particularly like the oily feel (it’s the same with Williams Lectric Shave), it won’t gunk up your shaver. When using a very comfortable razor like the Braun Series 7 the pre-shave didn’t make a significant difference; however, shaving with Panasonic Arc 3 or any other more aggressive shaver was a lot more comfortable. I have very sensitive skin, especially on the neck, and shaving dry with most electric shavers is a challenge. While it wasn’t perfect, the comfort during the shave was greatly improved and I didn’t experience that post-shave rash or any stinging. A wet shave is still the way to go in my case, but using a pre-shave is clearly the next best thing, especially if you have sensitive skin and your shaver tends to cause razor burn and irritation. The closeness of the shave is another key area where using a pre-shave should provide an improvement. I personally expect a reasonably close shave from an electric shaver, so I am not extremely demanding in this regard. And I usually get a very satisfactory shave on the cheeks and neck, but right below my nose and on the chin, I have very thick and dense stubble, so getting a close shave requires some extra work and a capable shaver. Compared to not using any pre-shave and just grabbing the razor and do a quick dry shave, the Lab Series actually worked. If you’re using an electric shaver that isn’t particularly great at cutting the hairs very close to the skin, you will likely see an improvement. An indirect benefit of the added comfort is that you can actually press a bit harder without getting razor burn, thus getting a closer shave. After completing the shave your face will feel smooth and plump and well moisturized. However, even after rinsing with cold water it would still feel a bit oily. But then again, this is the case with pretty much all the other pre-shave lotions. 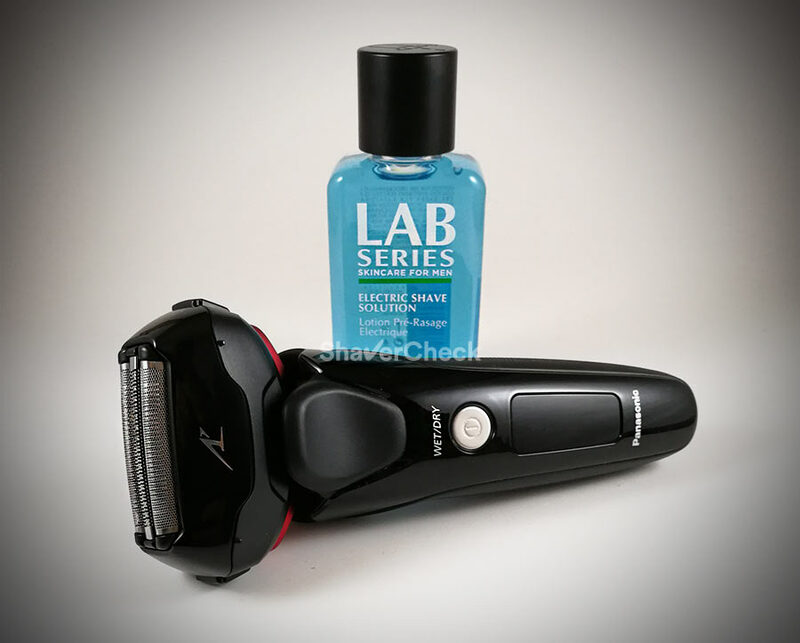 Lab Series Electric Shave Solution — Is it worth buying? In conclusion, the Lab Series Electric Shave Solution really works. But does it work so much better compared to other pre-shaves out there? Is the higher priced justified? In my opinion no. It performed almost identically to the much more affordable Williams Lectric Shave, which is still the one to buy for most men. In fact, I would go as far as saying that the closeness of the shave was a bit better in the case of the Lectric Shave. There’s really only one situation when you should opt for the Lab Series and that is if you absolutely must use a fragrance-free pre-shave. 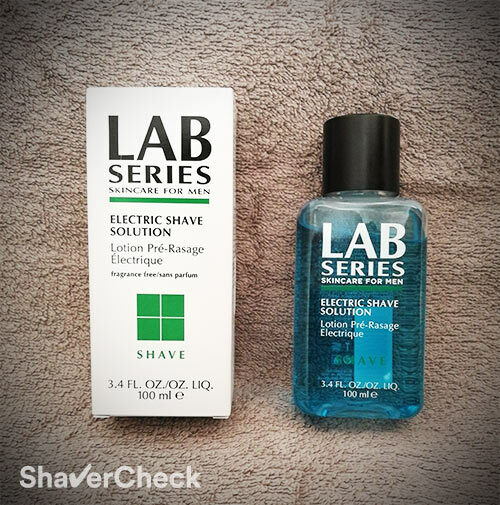 Whether your skin is very sensitive to perfume or you’re simply turned off by the “cheap old-fashion cologne” smell of the Lectric Shave or Afta, the Lab Series pre-shave is pretty much the only widely available option. As mentioned previously, the Lab Series solution really works, but so do other less expensive pre-shaves. 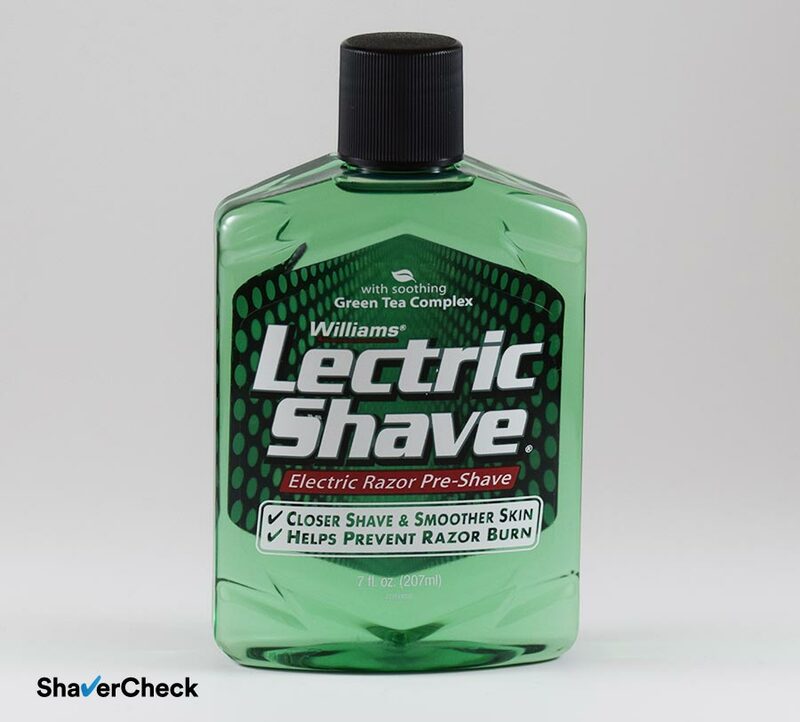 The Williams Lectric Shave is the unofficial benchmark as it’s a tried and tested, inexpensive product that you can get anywhere. Performance-wise they’re pretty much identical, so if the somewhat off-putting fragrance is not an issue, you should probably get the Lectric Shave as it costs significantly less and works great. For more details, make sure to check out this pre-shave guide that documents the most popular and effective products out there. 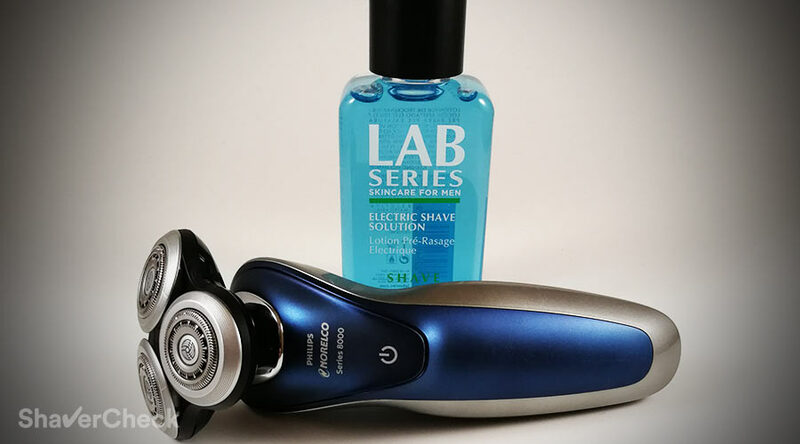 Home » Articles & Guides » Product spotlight » Aramis Lab Series Electric Shave Solution: Is It Worth Buying? Thank you for the suggestion, David. Just placed an order for one, really looking forward to trying it. Haven’t received it yet, David (order placed on amazon UK). Just shaved with Freelette for the first time and I must say it’s a fantastic product. One of the best dry shaves I’ve ever had. And it smells a lot nicer than any other pre-shave out there. Thanks again for the suggestion, David. I will also be doing a proper review soon. Try Neutrogena Men Sensitive Skin Shave Cream. I recently got this last week and I’m happy I did. I get a smooth shave with my Panasonic ES-LA63-S. You should review it. I shave once every three days. Wanted to say my Grandfather got me started on Williams Lectric Shave. It’s still cheap and it still works fine for me. I enjoy your website and an glad to read what other guys have to say. Good article. My concern would be the non-organic nature of many of the ingredients. Do I really want to rub these ingredients into my face and neck? Do we know what long term effects exposure to these might cause? I generally don’t shave wet nor do I need a pre-shave. I have both a series 9 Norelco and a series 9 Braun and interchange them whenever I want a change. I’ve never felt a need for anything extra but that’s just me, I guess. Thank you for the comment, James. I personally am not too worried about this. Just because an ingredient is non-organic doesn’t necessarily mean that it’s unsafe. Also, there is rigorous testing before approving this type of substances in personal care products.